This is why you order pizza, people! Delivery drivers can’t take a slice (well they could, but it’d be pretty obvious), and if they stole a topping it’d also be very noticeable. Instead, confirming some people’s fears and suspicions, a delivery driver has been filmed tucking into someone’s food – what appears to be a couple of rice dishes – before popping the lids back on, resealing the bag and, presumably, delivering them to a hangry customer. The video was captured by a local resident from his balcony in Madurai town, in southern India. It clearly shows the man pulling up on his scooter and opening up his storage box. He then whips out a box of food intended for a customer, gets out a spoon and helps himself to a few decent mouthfuls. Also, is it me or, at the beginning of video, is he levelling out the food in the first container, trying to cover his tracks? Either way, it doesn’t look good (his actions, not the food, I assume the food was delicious and that’s why he couldn’t help but tuck in). Once he’s had his fill, the man reseals the carton and put it back in the delivery box before pulling out another carton of food, helping himself to some more, and then stashing it back in the box. 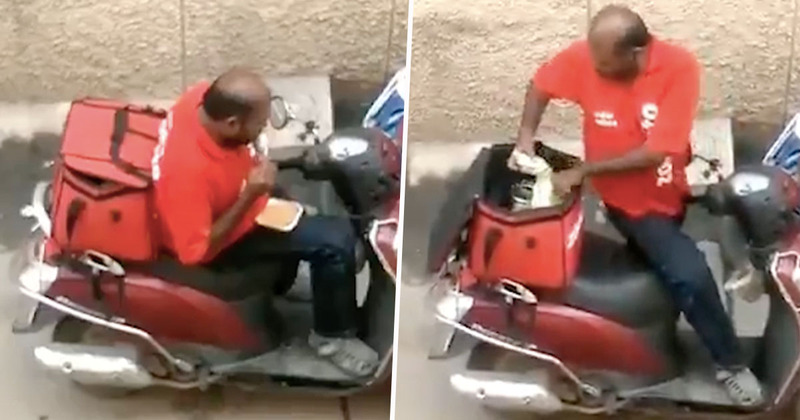 The video went viral on social media and triggered a heated debate on the role and responsibilities of food delivery companies in the country. The man was working for Zomato, an online food aggregator in India, which has now sacked the delivery driver following an investigation.